With the BA or BS in business degree (all five tracks), international students in the United States on F-1 visas are eligible to work for three years in the US and gain valuable experience in the workplace. Pursue a degree or take coursework in business that builds on the principles of economics and statistics. Schedule an appointment or visit during walk-in hours. You can also meet with business peer advisors. Beta Gamma Sigma is the exclusive business honor society, associated with AACSB International. As one of the nation’s leading graduate education institutions, the Simon Business School consistently earns high rankings and recognition. 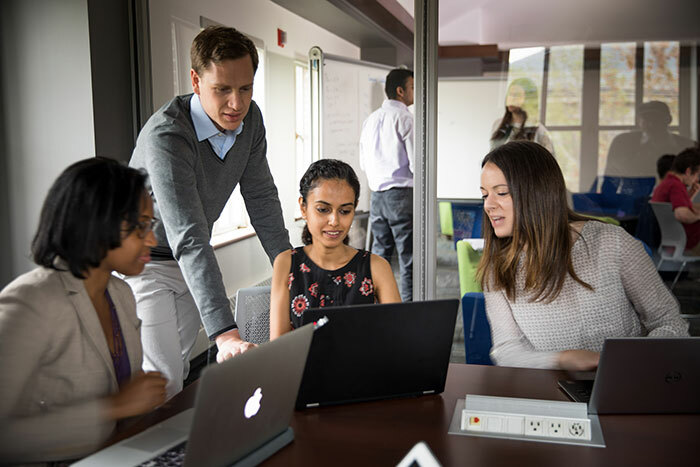 Our program’s close ties with the business school mean that undergraduate students can learn from business leaders in small, close-knit classes. As a University of Rochester undergraduate student, you are may be eligible for special access to the Simon Business School, including fee and GRE/GMAT waivers as well as scholarship opportunities for admitted students. At Rochester, we take pride in a diverse student body. Read through our student profiles to learn why some of our students chose to come here, how they get involved outside the classroom, and about the kind of experiences they have had while attending the University of Rochester. of business graduates have gone on to work with firms, such as Ernst & Young, J.P. Morgan and Chase, Citi, Credit Suisse, Amazon, and Nielsen or to graduate school. Want more information about the undergraduate business program? Contact us.